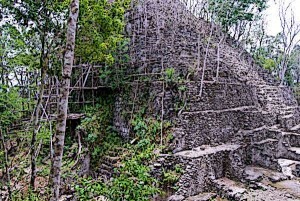 Mayan civilisation underwent two major periods of collapse. The Classic Mayan civilisation, which was truly the heart of the Mayan culture and had thrived for more than a thousand years in Mesoamerica, came to a rapid end sometime around the 8th and 9th centuries. This collapse effectively brought an end to all the Mayan cities and centres in the southern Maya lowlands, effectively eliminating the civilisation from the region. Historical researchers have been unable to come to an exact cause for this first rapid collapse of the Mayan Civilization. The second and conclusive Mayan collapse came in the 16th century with the Spanish conquest of Mesoamerica. Since the researchers are not absolutely certain as to how the Mayan civilisation collapsed at the end of the Classic Period, many possible theories have been proposed. It has been variously claimed that the Mayans cities in southern lowlands underwent rapid decline because of certain environmental changes. It has also been proposed that the collapse was a result of a foreign invasion so that the invaders left the region after plundering the Mayan cities, burning some of them. Some have forwarded the possibility of epidemic diseases as the potential culprit, a factor which would have rapidly eroded the populations in the Mayan cities and forced the survivors to flee to other areas. Among the oldest sites of Mayan archaeology are the ruins of the El Mirador city. There is nearly a consensus between researchers and archaeologists that the definitive decline of the Classic Mayan civilisation began sometime in the 9th century. Copan Valley and its historical population is considered a good litmus test for the population changes in the Mayan regions during the 9th and 10th centuries. The Valley was home to Copan, one of the most influential Classic-era Mayan cities. The population of the Copan Valley is estimated to have been nearly 28000 by 800 A.D. This population was down to a mere 15000 by the year 900 A.D. and continued to decline continuously in the subsequent decades. The overall decline of the Mayan civilisation in the southern regions also forms a parallel to this. Some researchers believe that the collapse of the Mayan civilisation at the end of the Classic period was brought about by foreign invaders. According to this theory, non-Mayan people located in a region probably near the gulf coast began the invasion of the Mayan regions sometime in the 9th century and within a century or so, they brought about the end of the Mayan civilisation in the whole region. Toltecs, the city of Teotihuacan and many other historically known political and social entities are cited as the possible invaders of Mayan lands. Although some archaeological evidence suggests attacks and invasions during the collapse period, it is insufficient to substantiate the theory. Epidemic diseases and their rapid outspread can decimate an entire population in a short time. And if they persist, they can force a large portion of the surviving population to migrate to other regions. Such epidemic diseases have been cited as another potential factor which would have caused the Mayan collapse in the Terminal Classic era. Proponents of this theory state that several endemic infections are common in the tropical environment that Mayans lived in. And that by bolstering rapid urban growth, Mayans may have disturbed the ecosystem and encouraged the growth of the pathogens causing such infections. This theory is considered a viable explanation as one of the many causes that may have contributed to the Mayan collapse. Climatic changes have been responsible for the downfall of many grand civilisations over the course of human history. In the case of Mayans as well, the most reliable theory to date is that the civilisation came to an end as a result of adverse environmental conditions. Mayans relied heavily on agriculture and the regions they occupied weren’t very conducive to it. Mayans regions of Yucatan and Peten were frequently hit by droughts. Modern research, gathering historical environmental and drought data from the southern Mayan regions, shows that the region was hit by a series of droughts during the period when the Mayan civilisation collapsed. A factor such as droughts could have led to warfare, invasions, civil discord, migrations and many other factors which typically contribute to a civilisation’s downfall. Mayans relied heavily on trade with other city-states, including many non-Mayan states. Most notable trade links existed between the Mayans and the city of Teotihuacan which was at its peak during the early Classic Period. It is believed that sometime around the 7th century, the city of Teotihuacan underwent rapid decline and collapse. This forced the Mayans to forge trade connections elsewhere, notably with political entities along the Gulf Coast and highland Mesoamerica. Proponents of this theory believe that these trade ties didn’t prove long-lasting and their failure forced an end of the Mayan civilisation. An interesting theory that has been cited by researchers in the final decades of the 20th century states that the Mayan collapse may have come about due to an erosion in the authority of Mayan rulers. This theory states that as the Mayan city-states grow up in size and became home to more complex forms of society, the traditional religious rituals no longer held a strong enough sway over the populace. The royal authority also diminished as it became harder to rule with a centralised form of government. Proponents of this theory state that the inability of Mayan rulers to adapt to changing social conditions led to a failure of social and political systems, and consequently the civilisation collapsed. The Mayan civilisation came into being in the tropical rainforests of the southern Maya lowlands. The civilisation reached its peak during the Classic Period, ranging from 3rd century to 9th century. At the end of the Classic Period, Mayan civilisation in the region came to an abrupt end. Although scientists and researchers have been unable to ascertain the exact cause of this rapid collapse, one of the most convincing theories is that Mayans had to confront serious droughts and adverse environmental conditions in their homeland. This led to social and political instability and ultimately forced Mayans to shift to other regions in Mesoamerica. Many other potential explanations also exist for the Mayan collapse, although they are based on looser and less convincing evidence.